The US writer Philip Roth has been bestowed with the 2012 Prince of Asturias Award for Literature, as made public today in Oviedo by the Jury responsible for conferring said Award. The Jury for this Award –convened by the Prince of Asturias Foundation– was chaired by José Manuel Blecua Perdices and composed of Luis María Anson Oliart, Juan José Armas Marcelo, Xuan Bello Fernández, Blanca Berasátegui Garaizábal, Amelia Castilla Alcolado, Juan Cruz Ruiz, José Luis García Martín, Álex Grijelmo García, Manuel Llorente Manchado, Rosa Navarro Durán, Soledad Puértolas Villanueva, Fernando Rodríguez Lafuente, Fernando Sánchez Dragó, Diana Sorensen, Sergio Vila-Sanjuán and Román Suárez Blanco (acting as secretary). This nomination was proposed by Michael Göring, Chairman of the Board of the ZEIT-Ebelin and Gerd Bucerius Foundation (Germany). Philip Roth was born in Newark (New Jersey, USA) in 1933. He attended Bucknell University and then the University of Chicago, where he completed his M.A. and taught English Literature. He subsequently taught creative writing at both Iowa and Princeton and Comparative Literature at the University of Pennsylvania. He retired from teaching in 1992 to devote himself entirely to writing. He is considered the most representative writer of the so-called Jewish School of the North American novel. His first book, Goodbye, Columbus (1959), a book of stories about Jewish life in America, placed him in the forefront of success and literary prestige in his country. The short story that lends its title to the book was made into a film in 1969. In Letting Go (1962), he recounts the agony of a young Jewish professor who is torn between reason and feelings. Portnoy’s Complaint (1969) is written in the form of an autobiography and recounts the sexual life of Alexander Portnoy through a monologue from his psychiatrist’s couch. The novels The Breast (1972) and The Great American Novel (1973) marked a shift towards fantasy literature, while My Life as a Man (1974) noted a return to more introspective themes. The books The Ghost Writer (1979), Zuckerman Unbound (1981), The Anatomy Lesson (1983), The Human Stain (2000) and Exit Ghost (2007) recount the life and career of the writer and central character Nathan Zuckerman. His most recent books are: Shop Talk: a Writer and His Colleagues and Their Works (2003), The Plot against America (2005), Everyman (2006), The Humbling (2009) and Nemesis (2010). 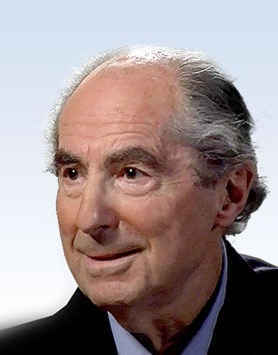 The only living writer whose works are being published in their entirety by The Library of America, Philip Roth won the USA’s major literary awards during the 1990s: the National Book Critics Circle Award (1987 and 1992), the Faulkner Award (1993 and 2000) and the National Book Award (1960 and 1995). In 1997, he was awarded the Pulitzer Prize for his novel American Pastoral. He also received the Czech Republic’s Karel Capek (1994) and Franz Kafka (2001) Awards. Outstanding among the recent awards with which he has been distinguished are the Prix Médicis for best foreign novel (France, 2002), the Sidewise Award for Alternate History (UK, 2005) and the Nabokov Award (USA, 2006). In 2007, he received the PEN/Faulkner Award for Fiction, for Everyman, and the PEN/Bellow Award. He holds the National Arts Club Medal of Honor (USA, 1991), the National Medal of Arts (USA, 1998), the Gold Medal of the American Academy of Arts and Letters (2001) and the Medal of the National Book Foundation (2002) for his contribution to American literature. Roth received the Man Booker International Prize in 2011. According to the Statutes of the Foundation, the Prince of Asturias Awards aim “to reward the scientific, technical, cultural, social and humanistic work performed at an international level by individuals, institutions or groups of individuals or institutions”. As part of this spirit, the Prince of Asturias Award for Literature shall be conferred on those “whose literary work represents a significant contribution to universal literature”. This year a total of 24 candidatures from Australia, Brazil, Canada, Colombia, Cuba, China, France, Guatemala, Holland, Ireland, Japan, Macedonia, Portugal, Rumania, Senegal, South Africa, Turkey, United States and Spain ran for the award. This is the fifth of eight Prince of Asturias Awards to be bestowed this year for the thirty second time. The Prince of Asturias Award for the Arts went to Spanish architect Rafael Moneo, the Prince of Asturias Award for Social Sciences was given to American philosopher Martha C. Nussbaum, the Prince of Asturias Award for Communication and Humanities went to Japanese video game designer Shigeru Miyamoto and the Prince of Asturias Award for Technical and Scientific Research was jointly bestowed on British biologist Sir Gregory Winter and the American pathologist Richard A. Lerner. The Award for International Cooperation will be made public next week. The Prince of Asturias Awards for Sports and Concord will be announced in September.